Štepalica: How did I start writing for Sew News? 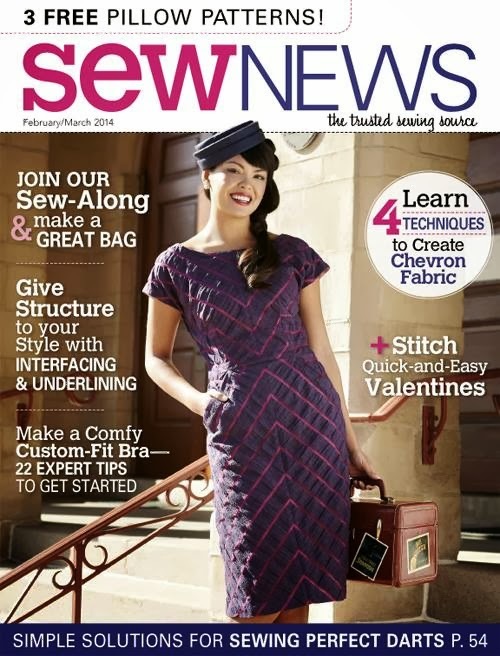 How did I start writing for Sew News? I'm frequently asked by acquaintances from both real and virtual world on how I started writing for Sew News magazine. I have to admit it, it's quite unusual to hear that a woman from Serbia, who still lives in her homeland, writes for a foreign magazine about sewing. I don't know anyone from here who does the same thing. A local fellow blogger Jelena has the most similar experience, she writes custom ordered blog posts on various topics for various clients. We're not doing the same thing, but you get the parallel between us. Those who don't sew at all think that I write either about fashion or they have no idea what I could be writing about - cause what's there to write about when it comes to sewing! Those who more or less have some insight in sewing usually think I'm selling my hand made garments via the magazine, or my patterns (the later one isn't far away from the truth). However, no matter whether they sew or not, local people think I write for Burda, since it's a local synonym for sewing. Friends who know me well and who remember the first time I mentioned I was starting to write for a certain American magazine can't really distinguish the difference between my work for Sew News and Burda Style - I can't blame them, both Burda Style and Sew News happened to me at the same time. So I thought it would be interesting to you to read about how and when I became a Sew News columnist and what it looks like to work for the magazine. Back in 2008 I discovered BurdaStyle website, which was brand new at the time. It had less than 100.000 members (now it has approximately a million members) and it was a small yet opened community of people who were fascinated with sewing. It was something like Facebook for dressmakers. I signed in to acquire some of their free patterns that were available at the time and for some moral support - I needed to show my creations to someone who was genuinely interested in sewing. I needed someone to pat me on the shoulder and tell me "Well done, you make nice clothes! ", as I didn't know anyone who sewed and I had no one beside my mom to admire my work (and at the time, my mom wasn't available either, since I had moved from my parents' house). I had no idea at what level my sewing skills were, since I had no one to compare with. And I was self taught... I had no idea of how much I knew and I thought I didn't know much. However, as I started posting pictures of my creations, and following other members' works, I realized I knew a lot - I was better than average, but I had a lot to learn. I started absorbing any information I could find about sewing and I sewed like a maniac. During the next six months my sewing technique increased rapidly - practice made wonders! Honestly, my competitive spirit helped me a lot; while watching all those lovely and impeccably made creations other members had made I was moved to improve my own precision and to pay more attention to details. I wanted to be the best and I wanted to be noticed by other members. When I realized the website had an option for members to post their patterns, I decided to try and make one myself! 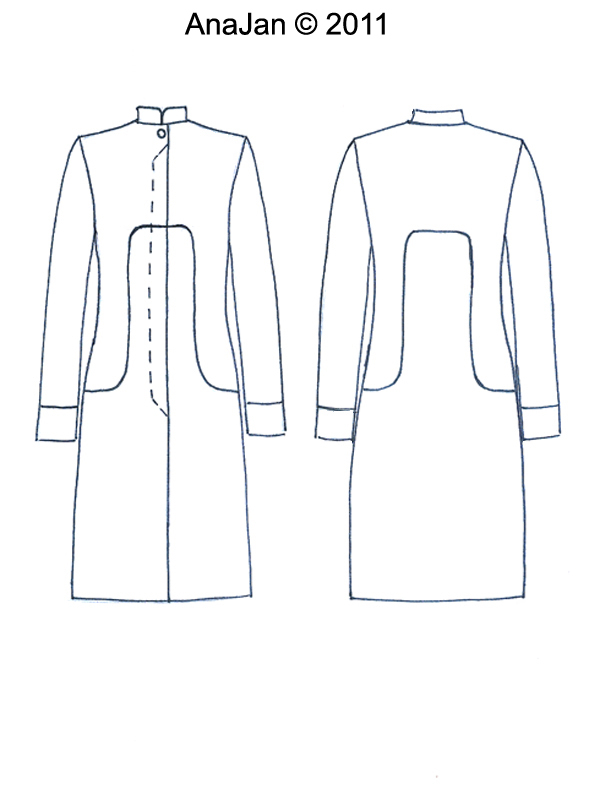 Drafting a pattern wasn't difficult - I used a commercial pattern as a basis and altered it according to my design. However, converting it into a PDF file was a challenge. But, I mastered another skill and made my first amateur sewing pattern for the AMC dress and uploaded it to the website. The pattern was quite successful, and had some solid reviews. So far it has been downloaded approximately 20.000 times - not bad for a beginner! Along with the eight patterns I had posted to the website, I started writing instructions and tutorials for pattern alterations. One of them, for making the leaf pleated dress drew attention of Ellen March, the editor of Sew News magazine. Honestly, even though the tutorial was quite understandable and straight forward, it was so sloppily done with lousy photos. I still don't understand how Ellen dared to offer me to write an article about the dress for the magazine - which was exactly what she did. I thought I was dreaming. Since we don't have an access to the magazine here in Serbia, I was afraid her offer was some sort of a scam and that I wasn't communicating with real Ellen but with some manipulator. But I didn't let that frighten me, I called some American bloggers for help, and asked them to write me a few words about the magazine. One of the ladies I communicated with directed me to a person who actually worked as a collaborator for the magazine, so I was assured Ellen was a real person and her offer was no scam. And so I accepted the collaboration. However, I decided to be proactive and take my chance while I had it - when Ellen and I were defining terms of the collaboration, I proposed her to make a regular column that would teach pattern drafting. 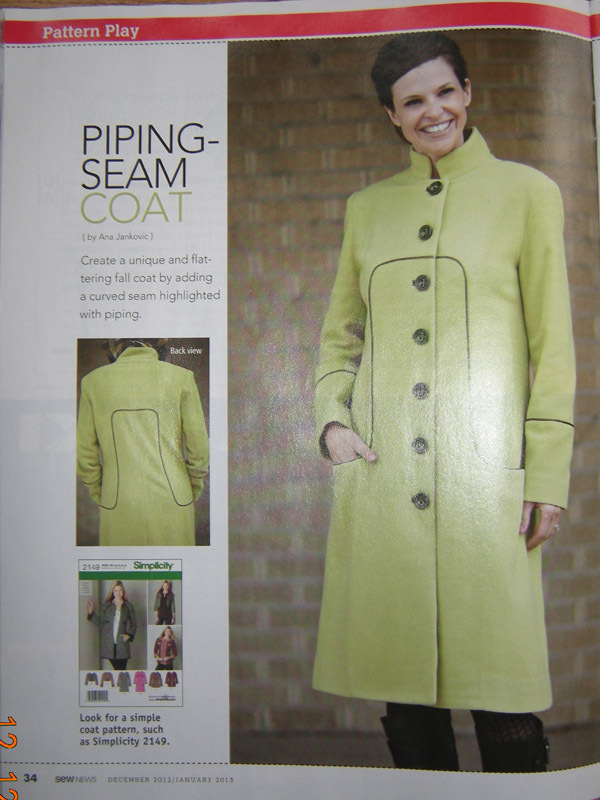 She liked the idea, and the Pattern Play column was born, we signed a contract and I became a columnist of Sew News. I can't explain how excited I was. I had to wait for ten months to get my first article published, which was a nerve wrecking period to me :). I was assured I wasn't dreaming it all when I got my issue of the magazine in January 2011. It was all real! Many are surprised when they realize each of the items published in the magazine travels back and forth from Serbia to Colorado in order to be photographed. Also, many think my articles are written with no plan. In fact, each of the magazine issues and articles that are featured in it is thoroughly planned, months in advance. I propose the topics - I provide a short description of the garment I will write about, I attach a photography of it (in case the garment is already made), or a sketch or a photo of a similar garment, with notes on the fabric I will use and what would be the focus of the article. Since I write six articles per year, I make a list of at least eight suggestions, and I make sure I have at least half of the items from the list already made. This gives me enough time for sewing some additional garments during the year. It's important to me to know that the items I suggested to Ellen are the ones I'll still like when it's their turn to be sewn, so I chose the ones I've been fascinated with for a while. I also copy famous designers frequently. According to my suggestions Ellen picks topics for the next year, we make an annual plan, set the deadlines for each of the articles and sign a preliminary agreement. All in all, I have to have each of the garments ready at least ten months before the issue the garment will be featured in is published. And ten months goes from the moment I send a garment to the States for a photo-shoot till the moment I get it back. Quite often I sew a garment just before it is sent to Sew News so I don't get a chance to wear it before that. Each article requires three things: the text that describes the process (usually a pattern drafting process), photos or illustrations that demonstrate the described process, and a finished garment which is the subject of the article. I write the article in a technical manner - with the step-by-step instructions. The editor edits my text, makes all the necessary corrections to my English and writes a brief intro to the article - usually it's a short text that describes the garment itself. I'm glad I don't have to do this part of the job, as I am not one of those people who can write witty and catchy headlines that draw readers' attention. Once all the material for the article is collected by the editor, she sends me a contract to sign. After that I get my check, usually three months before the article is being published. Occasionally I get an opportunity to write additional articles, like I did with the February - March 2014 issue. Topic of these articles is usually some sewing technique which I suggest or the editor asks for. This part of the job is optional and if the editor and I agree on this, we sign an additional contract. First of all, I've done something good for myself by getting out of my comfort zone. I was insanely lucky to be spotted by the editor of the magazine, among thousands of other members of Burda Style, however I can't be too modest about it - I mean, my work got noticed among thousands of other items on the website! Also, my boldness played a major part in the story - I knew I was able to work the magazine, and I asked for more than I was initially offered, and I got what I asked for! After I started writing for the magazine, I realized no one from Serbia nor the region knew about me and my work, so I decided to start blogging. So, here I am, three and a half years later, slowly making my blog a business that brings some profit. My blog was bilingual because I had already knew a lot of people from the sewing community who were from abroad, and I didn't want to lose their friendship and support. I think it was the right decision, which lead me to meeting some new friends and getting to know people from all over the world, all thanks to Štepalica. I've realized what I should do for a living. Years before I started writing about sewing I was looking for a way to cash in my creativity, but I wasn't interested in making custom fit garments for others. When I was given this chance, I realized the merge of writing, pattern drafting and sewing was a winning combination to me. This lead me to thinking about starting my line of sewing patterns, which was exactly what I did. My self confidence has increased a lot. I've never been one of those people who are shy, but I wasn't bursting with confidence either. Now I feel I can do whatever I set my mind to. I have improved my English. Seven - eight years ago my English knowledge was solid, but when I tried writing my first comment and garment description, I was stuck - I was completely unfamiliar with the sewing terminology. As a comparison - now I find it easier to write about sewing in English than in Serbian. Writing in English every day has helped me improve the language, and I think it gets better and better every day. I hope I haven't drowned you with this post, and that I have answered your questions on how I started working for Sew News. Also, I hope I have inspired you to move and get out of your own comfort zone. It's not that hard, I swear! I find this all fascinating. You are truly blessed to be able to market your skills so widely. I know it will just get better and better for you as time goes along! You are a great asset to the sewing community. Thanks Bunny! I think I was, and still am really lucky. It's been four years since I started working for Sew News, but I'm still stunned and sometimes can't believe it's all happening to me. hvala ti na ovom inspirativnom postu. trebalo mi je da pročitam ovako nešto. član sam crafters.org foruma godinama, ali nikad se nisam odvažila da napišem i jedan post. samo gledam i mislim jesam li dovoljno cool da nađem sebi društvo tamo. i baš ću da probam. Zaista mi je drago da je post inspirativan, to mi je bio cilj. Apsolutno nemas sta da izgubis, mislim da treba da probas i da pocens da postujes. Od pasivnog gledanja nema nista, a ako se pokrenes, samo mozes da dobijes, naucis, upoznas nove, sjajne, ljude i ko zna sta jos! Samo kreni, i drzim ti fige! Thanks Ariada! Also, thanks for suggesting a great topic! I was wondering if you were interested in reading about these things. I'll try to make a new post about my work and time management. Amazing! I am so excited for you. This was really fascinating! I love reading other peoples stories, since I'm self taught too. The internet brings all of us together to share our passion. I'm so glad you've started publishing patterns since the Nougat is so spectacular I can't wait to see what else you come up with! Thanks Judy! I think we're all lucky to live in this technological era, who would have thought 15 years ago sewing would bring us together online someday? 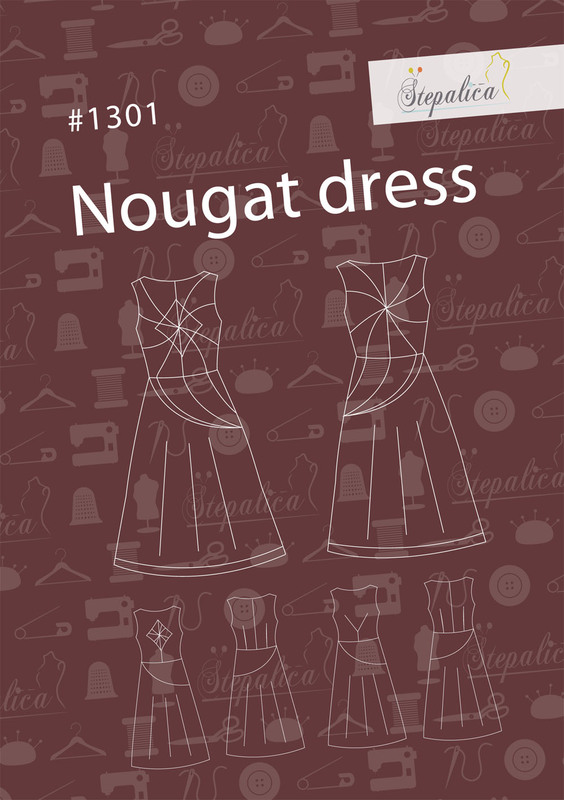 I hope the new pattern I'm working on will be as interesting as the Nougat is. Very interesting story! You are obviously very talented lady, and no wonder you were 'spotted' by Sew News editor. Looking forward to seeing your new patterns as you have an eye for an unusual "twist" in a pattern. 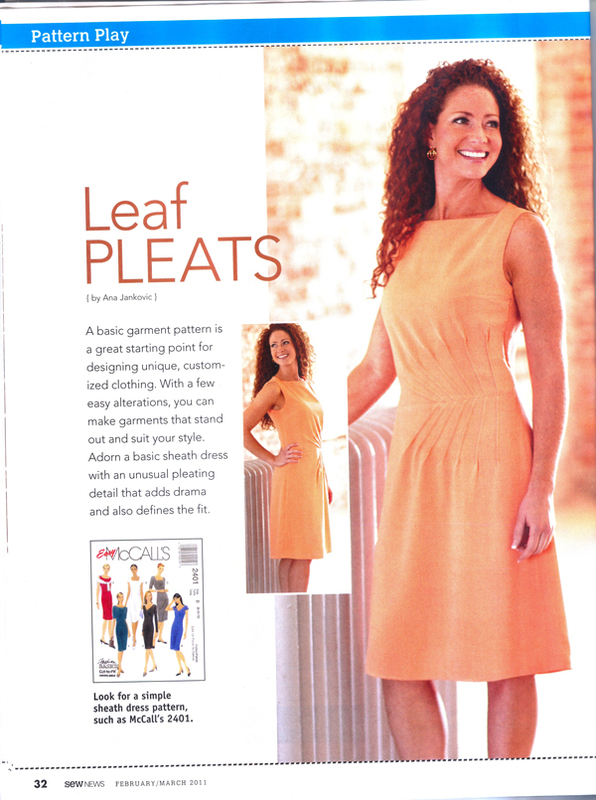 Love you "leaf pleats" by the way! Thanks for the nice words! Oh yes, I love mixing the classical style with unusual details. I also find it amazing how simple these details can be and still can make the garment pop in the crowd of many other garments. Thank you for sharing. This is an inspiration for me. You are quite talented by the way (I follow you on Burda). It's always a pleasure to hear how you're progressing! Thanks so much for sharing! Kako sam počela da pišem za Sew News časopis?